A personal film about a public subject, MY FATHER’S VIETNAM explores the human bonds forged and shattered by war. Set against the backdrop of never-before-seen photographs and 8mm footage of the Vietnam War, the film is the story of three soldiers, only one of whom made it home alive. MY FATHER’S VIETNAM won the Soldiers and Sacrifice Grand Prize at the 2015 Rhode Island International Film Festival (RIIFF) and the Best Picture Documentary at the 2016 Flagler Film Festival. 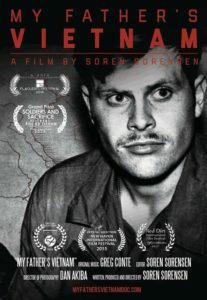 MY FATHER’S VIETNAM was directed by first-time filmmaker Soren Sorensen. Gravitas Ventures will release the film on VOD and across all other digital platforms on May 24, 2016, to coincide with Memorial Day Weekend. Director Sorensen joins us to talk about his father and the other soldiers that went to Vietnam and never truely came back. This entry was posted in adaptation, documentary, drama, Film School interview, Indie by admin. Bookmark the permalink.